AVIVA Rental Systems is Virginia's source for 3-chip digital video camera rentals. Choose from the Canon XL1 or the Canon GL-2 video cameras. AVIVA also has a selection of camcorders available for rental, including the JVC Everio camcorders. 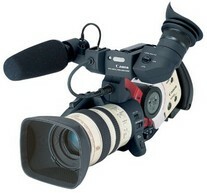 All video camera and camcorder rentals are subject to availability and are extrememly popular rental item. So, please contact AVIVA as far ahead of your rental dates as possible to make your reservation. Videotape your event with a 3-chip digital video camera like the Canon XL1 mini DV which offers great image quality and full digital power. The XL1's design and manual controls offer the widest range of picture possibilities. Additional features include top grip with recording controls, standard optical 16x zoom lens with SuperRange optical image stabilizer and 3 shooting modes. Click for specs on the Canon XL1 video camera. Or, use a slightly more affordable 3-chip digital video camera like the Canon GL-2. The GL-2 comes with the MA-300 microphone adaptor. The MA-300 is a microphone adapter and holder that lets you use up to two XLR microphones. It attaches to the camcorder's advanced accessory shoe providing power and connections without any wires. Click for specs on the Canon GL-2 video camera. Call AVIVA Rental Systems at 877.564.9143 to disucuss your overnight AV equipment rental delivery.